212 South Meets West Designer Palmer Weiss unveils her San Francisco home FEATURES cont. 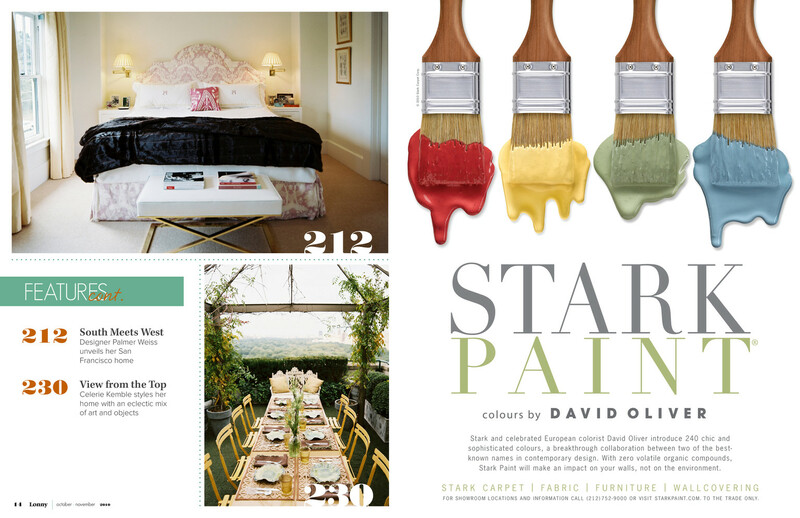 212 230 View from the Top Celerie Kemble styles her home with an eclectic mix of art and objects Stark and celebrated European colorist David Oliver introduce 240 chic and sophisticated colours, a breakthrough collaboration between two of the bestknown names in contemporary design. With zero volatile organic compounds, Stark Paint will make an impact on your walls, not on the environment. 14 Lonny october • november 2010 230 © 2010 Stark Carpet Corp. 184 STARK CARPET | FABRIC | FURN ITURE | WA LLCOVERI NG F O R S H O W R O O M L O C A T I O N S A N D I N F O R M AT I O N C A L L ( 2 1 2 ) 7 5 2 - 9 0 0 0 O R V I S I T S T A R K PA I N T. C O M . T O T H E T R A D E O N LY.